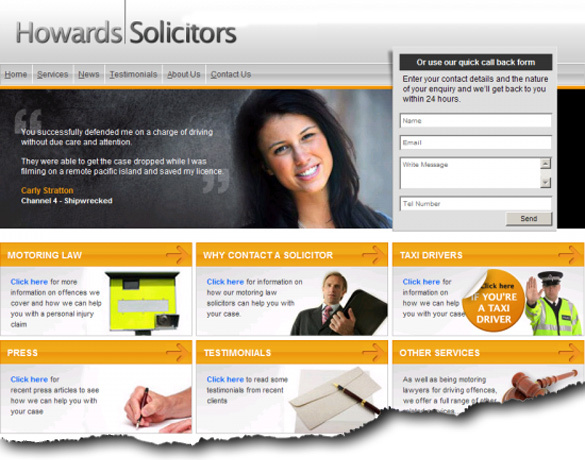 The client approached Sims Designs initially regarding a redesign of their website for their motoring offence lawyer site. They were also interested in achieving a high ranking for their new website so decided to use our seo services as well. As the website had just been redesigned we were able to work on the site in conjunction with Sims Designs website designers to optimise the site for the client. As with every project the client provided us with a list of search terms and we then targeted these for their website. After we had carried out a review of the site, their current rankings and popularity, we commenced upon a links campaign for the client. The site needed numerous backward links set up for it to improve it's link poularity. The site was also submitted to a good selection of directories and DMOZ. * This information was accurate at the time of writing. If you are interested in achieving a high search engine ranking for your website, please contact us today. Please see our blog for all the latest news and offers in regard to our website optimization services. We offer seo services starting from just £50 per month and we have a range of seo services to suit all websites and budgets. To see some recent sites we have worked on please see our seo case studies. Professional uk website optimisation services devon.